The SR-C4500 sleek, stylish design will fit nicely in all types of business venues. The 72 key position flat keyboard provides retailers the ability to easily sell and track the frequently sold individual items through a single keystroke. In addition to the flat keyboard buttons there are 7,000 PLU’s available to individually record sales activity of other specific items sold in the store. The SR-C4500 offers other analytical tools that include cashier/operator sales tracking, hourly sales, transaction key and electronic journal reporting. 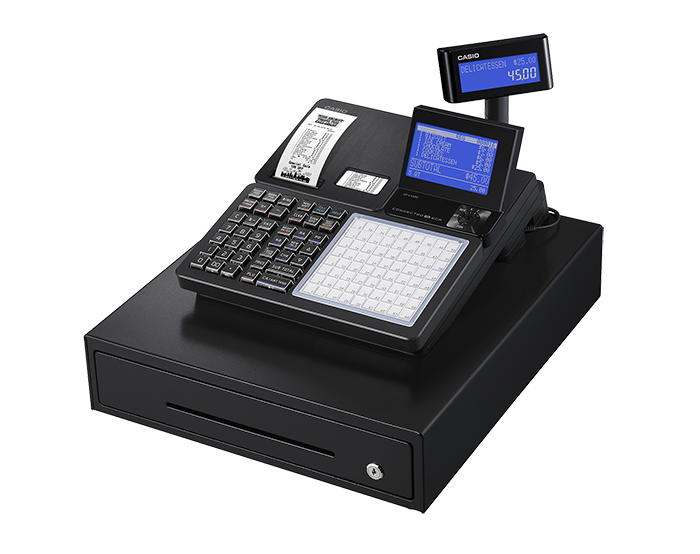 The SR-C4500 comes with a long list of functionality that surpasses most entry level cash registers. A guest check file is available for retailers operating small hospitality operations that require the ability to store and recall detailed orders. The SR-C4500 has a dual station fast and reliable thermal printer for receipts and journal printing. Receipts can be personalized with the store’s information, greetings and special messages. The 10-line operator LCD display with high definition Blue display makes data input easy to check the customer transaction. The pop-up 2-line customer display provides vital information to the end user as to the prices and items being entered. A medium sized heavy duty metal cash drawer is standard with the machine. The two (2) serial COM ports standard on the SR-C4500 allow a scanner and the PAX S300 payment terminal to be connected. Connecting a serial scanner will allow up to 3,000 items to be scanned and reported. Scanning items can be pre-programmed directly into the item file, during registration as a Not Found Item or through a Casio PC programming software. The PAX S300 interface provides merchants the ability to run EMV, credit, debit and gift card transactions through the SR-C4500. Merchants have the option of selecting from a large list of processors to work with through PAX rather than being limited to only one (1) processor. A SD Card slot is standard on the machine allowing owners a sense of security of backing up programming information and if need be re-loading programming. The machine also provides the ability of sales reports being saved automatically when the daily close operation is performed to the SD Card in CSV format. The SR-C4500 comes standard with Bluetooth (BLE Ver 4.1) communications for the purpose of linking up to smartphones running Casio’s Connect ECR+ free application. The Connect ECR + app provides retailers the ability to read and reset sales totals from the SR-C4500. The main dashboard on the Connect ECR + app gives a quick snap shot of the day’s sales activity and provides the sale results in graphical format. Viewing detailed individual reports (Financial, Transaction, Department, PLU, Cashier, Groups and Hourly) are also available to retailers to analyze the store’s performance. Connect ECR+ also offers the ability to transfer the daily sales activity to the cloud for the purpose of providing historical data to be viewed at anytime and anywhere with smartphone coverage. In addition to the sales activity features being available on the Casio smartphone app, programming the machine through Connect ECR + is also possible through easy to understand screens.